New year’s resolution time! It is a good idea to have a special time, at LEAST annually, to take stock and make some resolutions to “do better” where one has been lacking in the past year. I think of Paul’s resolution as he was leaving Athens and heading to Corinth. He said that he “resolved to know nothing but Jesus Christ and Him crucified” (1 Cor. 2:2). The video above is a song I wrote when I was helping to lead a summer camp that had as it’s theme for the summer “Be Still and Know”. I confess that I was NOT excited by this theme that I had inherited when I took the job as programming director of this camp. I would not have picked this as a theme for a summer camp if I had directed it for a hundred years. How was I supposed to design a camp where kids have the time of their lives - busy with lots of fun activities and, at the same time, teach them the importance of “being still”?!? As I plunged in and began planning for the summer, I came to realize how radically counter-cultural this very Biblical message was. The enemy of our eternal souls does all he can to keep us from knowing God. One of his greatest tools is to keep us BUSY. He does NOT want us to slow down, reflect, take stock or seek truth in the quiet moments. Satan is happy for us to be busy, even if that busy-ness is doing good things, like ministry. Keep your foot on the gas. There’s SO MUCH to be done. (the snake whispers) Keep going. Keep spinning those wheels. Go! Get! Accelerate! Accomplish! Move! Meet! Program! Produce! God says something different. He makes it clear when he says “Be still and know that I am God.” Take time to JUST be with me and you will KNOW me. Think of all Jesus needed to accomplish in His ministry. He had three years to SAVE THE WORLD - three years to bring the Kingdom of God from heaven to earth. On top of that, He had this very limited amount of time to train up a group of rag tag disciples to continue His work, to multiply it, and to keep it alive until it spread to the “ends of the earth”. So, how did Jesus kick it off? He spent 40 days alone! Forty days doing “nothing” - or so it seemed in our subverted mentality of “productivity.” And throughout Christ’s ministry, He continued to get away and make time to be alone with His Father. He often left crowds to just be alone - crowds who were clamoring to be with Him. Wait! Weren’t those crowds the reason He came? How could he just up and leave them when He had so much to teach them, so many sick to heal, so many injustices to be made right? If the very Son of God knew how much He needed to stop doing and spend time being, how on earth can I expect to be able to just stay busy and have what I need to live out God’s calling for my life? Be sensitive to God’s leading, and let Him lead you away from the rush to a quiet place with Him. Know Him. * my friend Jim Hall has a sign in his office with this statement - a great and needed reminder. The only way we can continue our global Kingdom ministry is through the amazing and generous supportof churches, friends and family. So many of our supporters have “stuck with us” through past transitions - some have been with us all the way back to the Jade Tree Project! We are so humbled and blessed and thankful for all who give financially to support our ministry and the work of Lumenations. When we left Albania, we prayed that the Kingdom work we were a part of would continue. We also desired to return regularly to encourage and bless that continuing work. In July of this year, Robbie and I (Ken) were able to return and witness God’s continued blessings in Elbasan and the surrounding villages. I was especially thankful to see the discipleship training materials we developed being used in many places around Albania and being reproduced and passed on to others who we don’t even know! We give thanks for this great work in Albania. We are blessed to see this visionthat we call Lumenationsbecoming a reality. Lumenations started officially in January. This has been a foundation-building year and we have had many challenges that we continue to see God help us overcome. We know the success of this work is completely in His hands and we trust Him to use us well. We give thanks for our first year of Lumenations! In early June of this year, our first Lumenations “story-gathering trip” became a reality when I went to Rwandaand was super blessed to be joined there by his nephew Jonathan Shackelford. We prayed for open hearts and opportunities to capture Kingdom discipleship work there. God answered our prayer! We learned so much in this first trip and we are so thankful for the opportunity. One of our goals for the first year of Lumenations was to recruit at least one individual who would catch the vision and want to join us full-time. Since this is a new organization, we knew that individual, couple or family would have to possess a pioneering spirit and be willing to truly step out in faith. We are thrilled that Aaron Leongcaught the vision and that he and Kimberlyare that answer to prayer! We know that you can be at “home” no matter where in the world God places you and we miss those we’ve lived near in the past. After over a decade of living a somewhat nomadic life full of dramatic transitions (including living in three different homes just this year), it has been a true blessing to “settle in” to our new home in Searcy. Our kids have tons of friends in the neighborhood. We are near much of our extended family and are able to help care for older parents in need. We’ve also been blessed with a great communityof faithful friends. We’ve plugged into a great church and we’ve also started a wonderful house church that meets twice a month. We give thanks for a place called “home”. We are thankful for our older children and their passion for the King and His Kingdom. Robbieis now a certified automotive technician and will be heading to Searcy to prepare for his fiancé’s eventual arrival, sometime next year. We are thankful for his passion for disciple-making. Bethanywill head to Northwest Arkansas this weekend to finish out her stateside midwifery requirements. She has connected with an amazing group going to work in one of the “stan” countries - the one she has felt God leading her too. We love her heart for the “least of these” and passion for the unreached. Shelbyhas been in Searcy since August helping care for my mom while going to grad school and working as a graduate assistant at Harding University. We are seeing so many open doors for her as she continues to bless and reach out to internationals. We are thankful for her gifts of creative leadership and outreach! And also, Jillian, who is now a teenager, is really blooming as a young lady of God and is an amazing “big sister” to her new siblings. God moves in amazing ways and we have seen Him do a beautiful work in the betrothalof Robbie to Hengrida Biçakuin Albania. Hengrida is really an amazing young woman of faith and we look forward to her arrival in the states and their life together in marriage. If you have not read about the story of how this came about and would like to, you can click on the picture to go my blog post written while in Albania. Today marks exactly two years since we made our “Shack family 2.0” announcement! 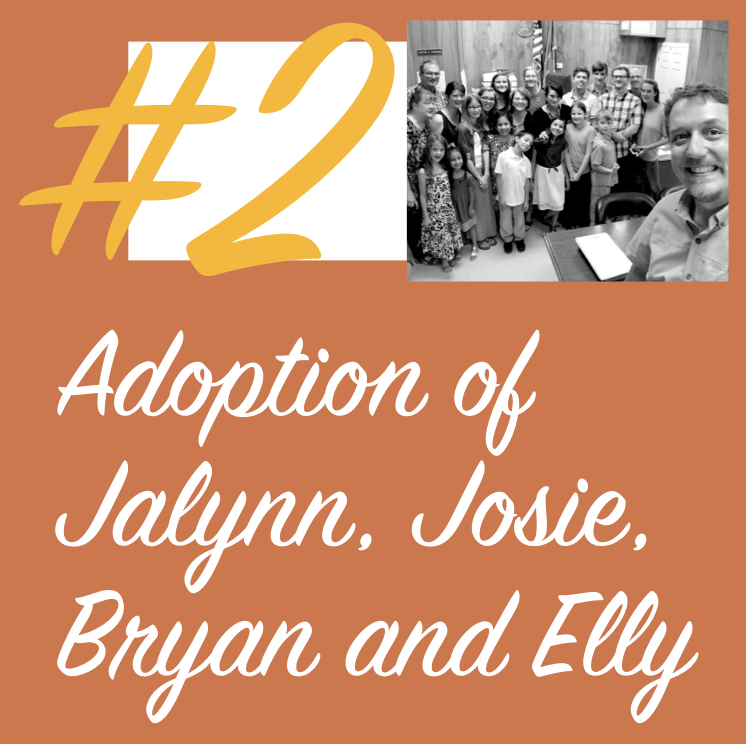 We are SO THANKFUL that Jalynn, Josie, Bryan and Ellyare now officiallypart of our Shackelford clan. Earlier this year in the month of June, we went to the Okmulgee, Oklahoma courthouse to have our adoptionof these beautiful children certified by the judge. We give thanks for our growing family! We are seeing our younger four grow so much in their relationship with Jesus and their family of God. We were so blessed to see the first-fruits of this with our 11-year-old Jalynn’s commitment to follow Jesus and her step of obedience to Him through baptism! We were grateful to share this with three of our four sets of grandparents as well! We are so proud of our daughter Jalynn Grace (11). She committed her life to Jesus today and followed His example and command in baptism. We rejoice in her new life in Christ and adoption into the family of God. Tanja and I love to pray. We believe prayer is powerful and effective. We've been blessed with so many stories of prayer being answered in undeniably supernatural ways. That, of course, leads us to believe in prayer even more. We have also discovered over the years that prayer is not a one-way conversation. It has taken a while and a lot of practice but we have learned it is just as important to be quiet and listen in prayer as it is to talk to God. One particular subject of conversation in prayer has been, of course, our children. We probably pray for them more than anything else. We talk to God about every aspect of our children's lives, their health, their friendships, their hopes and dreams and especially their relationship with God. As they have grown up, we have often prayed for their future spouses as well. About 4 or 5 years ago, we met a family in the church we were leading in Albania. From the very beginning, I sensed something special about the Biçaku family. There was just a special presence of God's peace covering over them. The husband and wife clearly loved each other and loved their children - four girls and a boy. The children, all of them, were very respectful of their parents and very well behaved which is sometimes a rarity in Albania as it is in many places around the world. When I first met their daughter Hengrida, I felt God speaking to my heart that this was the girl I had been praying for - for my son Robbie. At the time, she was 13 or 14 years old and he was just a couple of years older so I simply tucked that word from the Lord away for continued prayer. As I continued the ministry in Albania, though, I took special note of her family and of her. Hengrida always had a beautiful smile on her face. She was always looking for ways to serve and loved helping out with the children at church. She just had the light of Jesus' love flowing out of her. I shared with Tanja what I felt God had said to me and she joined me in prayer and also in observing Hengrida and her family. ...and we continued to pray. in the fall of last year, I noticed on Facebook that Hengrida's older sister, Qendresa, was betrothed. In Albania, it is still quite normal to do arranged marriages. 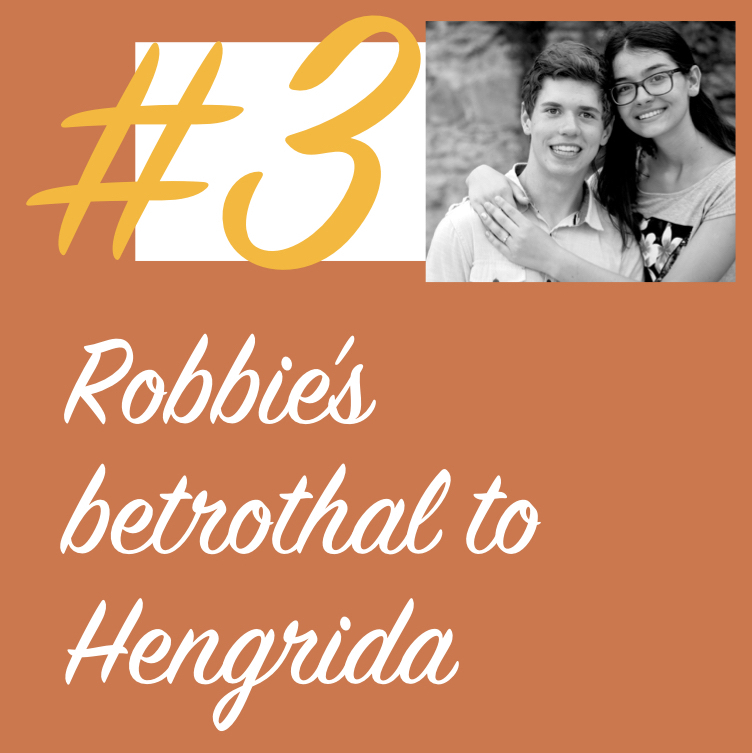 Early this year, as I was praying, I felt God leading me to go ahead and talk to Robbie about Hengrida. Robbie and I sat down in my office one morning before he was to leave to return home to Kansas City. I said, "This is going to sound strange and quite counter-cultural." He was probably thinking, "What's new?" [We're a pretty counter-cultural family in case you didn’t know that already.] I continued, "I am only going to share this with you once and ask you to pray about it. I will trust that you can hear from God about this one way or the other." I shared with him about Hengrida and her family and said that I felt that God wanted me to arrange a marriage for you with her. In Albania, unmarried single guys and girls don't do much with each other, especially if they are from conservative families, and the Biçaku's are pretty conservative - in a good way. So even though Robbie and Hengrida went to the same church for over a year, they had not really talked much. Robbie knew her and her family and they, of course, knew us but that was about it. Robbie agreed to pray about it. He actually fasted and prayed for a few weeks. He told his mom and I over the phone that, yes, he believes that this is what God wants for his future. Having lived in Albania, he understood quite clearly the serious nature of this arrangement. This is not something you do lightly and it is absolutely not something you propose and then back out of. We proceeded to communicate with Maksut and Mirjeta, Hengrida's parents, through mutual friends, Nick Wakely and his wife Sarah. The Biçakus were understandably quite surprised by this news from far away America. We asked if they would pray about it and, if they were in agreement, share this with Hengrida. We also asked, even though this is not culturally expected, that Hengrida have a say in the matter. We really wanted to make sure she had time to pray and hear from God on this as well. After several weeks of prayer, they communicated back to us and said that they also agreed that this was an arrangement made, literally, in heaven. Robbie and Hengrida began communicating via video chat and messaging. They have spent the past couple of months enjoying getting to know each other and falling in love. Yesterday, my son and I arrived in Albania and, in the evening, we met with the family to do the official betrothal. Though jet-lagged and tired, Robbie was very excited and also quite nervous! I asked Maksut for his daughter to join our family through marriage to my son and he said, "Yes! Of course!" We ate and drank together. Robbie also asked for his blessing to marry his daughter. Maksut stood up, walked over to Robbie and Hengrida, laid his hands on their heads and prayed a beautiful prayer of blessing. As the sun was setting, we looked out of their apartment balcony and noticed a beautiful double rainbow in the sky. This felt like a little kiss from God and a beautiful promise of a blessed life together. As I write this, I am sitting in a cafe in Elbasan, Albania. I just dropped Robbie and Hengrida off at the top of a small mountain overlooking the city. Even though we have gone the traditional route of arranging this marriage and doing the betrothal with the family, Hengrida also wanted the "western-style proposal." Maybe, at this very moment, Robbie is on his knee, holding out his arm with a diamond ring in hand and a very important question on his tongue. Though the answer to that question has been prayerfully pre-arranged by God and family and the parties involved, it carries no less weight. In fact, I believe it carries even more meaning than the romantic surprise questions being popped and put on Facebook for the world to see. I can't describe in words how much this entire thing has been saturated with the wonderful Holy Spirit of God. Do they know all they could know about each other before making this commitment to marriage? No, no engaged couple does. Will they continue to get to know each other more and more after they are married? Yes, every marriage is a journey of greater and greater knowledge of one's partner. Will there be days in their marriage that are hard and forgiveness is needed as well as a decision to keep on loving even if the feeling isn't there? Yes, every marriage will have those days and that is why every married couple needs God and His grace. Every couple in covenant relationship must understand that love is a daily decision and only the Spirit of Christ gives us the strength to do this. Do they need our prayers? I certainly hope so, who doesn't? Is an arranged marriage between an American boy and a European girl in the 21st century strange? Yes, of course, but maybe it's should not be so. I can say that this particular arranged marriage sure feels good and right and purposeful and blessed and filled to the brim with that special unconditional love whose source is found in Christ alone. To partner with the Shackelford's financially (or to move your support over to Lumenations for the Shacks), click on the pic above or click on the "Give" menu option at the top. Lumenations is ready to receive donations! Ken and friends have been working hard the past few weeks to get Lumenations up and running as an official non-profit organization. We are excited to announce that we are now ready to receive donations, including the support from those of you who have partnered with the Shackelford family. Many of you have continued to partner with our family and our global ministry. If so, thank you so much! We pray that you will stick with us in this transition and join this new exciting vision that focuses on mission, ministry, mobilization and media. For the rest of you, would you prayerfully consider joining with our family in a powerful global mission? All donations are tax deductible. For information on how to give, click the picture above. 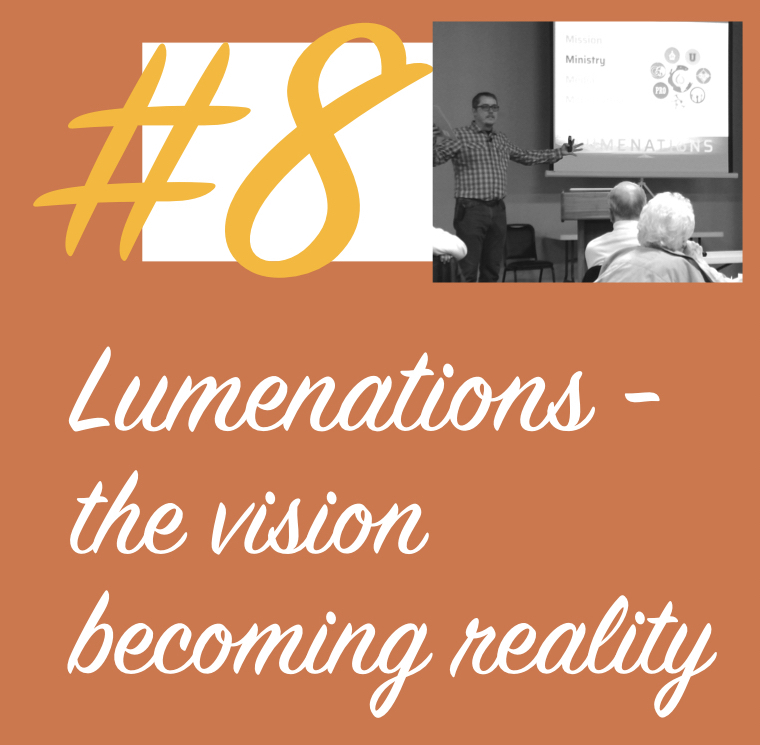 For more information about the vision for Lumenations, go here: www.lumenations.org. After we stepped down from our role with All Nations, we thought we would most likely be looking for a church ministry position. Back in July, we began immediately getting the word out and sending out resumes. Full time church ministry is a “comfort” place for us and, after 10 years of challenging and sometimes gut-wrenching global work, it sounded “nice” to say the least. BUT, we always want to do exactly what God wants for us, no matter how challenging it may be, so we continued in earnest prayer and fasting - seeking God for HIS next step for us. We were blessed to get some interest from some churches in Indiana, Kansas, Michigan and Oklahoma. Before we began moving forward with them though, we felt redirected by God - convicted that we were to continue our focus on disciple-making on a global scale. God is leading us to step out in faith yet again and move towards a vision that He has been working on Ken's heart for many years. We are calling this work “Lumenations”. 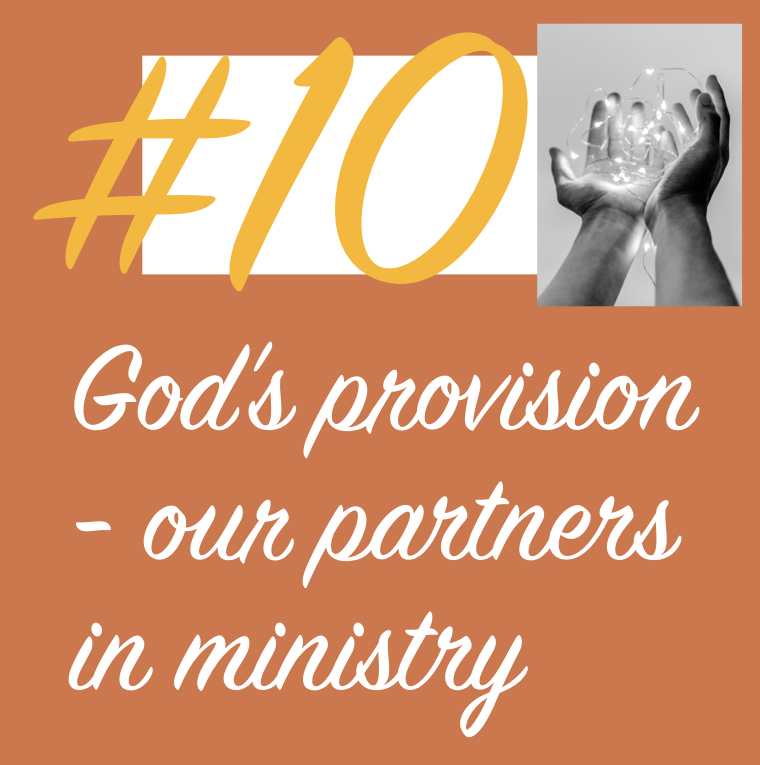 We feel the work of Lumenations has incredible potential to impact the Kingdom both here in the states and around the world by meeting several needs that we have witnessed in our stateside and global ministry and training work. We plan to stay in Kansas City through the end of the year to allow our adoption to finalize and then move to Searcy, Arkansas to "set up shop" for this work. We are partnering with J.P. and Heidi Wornock in this work. Heidi is Tanja's sister for those of you who don't know and their involvement was one of several BIG confirmations that this is the direction God is taking us. We also feel convicted to be closer to our parents in this season of life. Ken's mother has Alzheimers and is will be a blessing to help care for a woman who cared for so many so well in her younger years. Please pray for us as we transition our family back to Arkansas. Please pray for our adoption to finalize. Please pray for Bethany who will be moving back to the states, for Robbie who will be on his own as he continues work and college here and for Shelby who is making plans for global work in the near future. And please pray for Lumenations - for God to make this vision a reality and use it to spread disciple-making movements and cross cultural missions around the states and around the globe.